Hi there friends, how are you? We've had some lovely sunny spring-into-summer weather here in PamKittyville. The rain has stopped for at least the coming week so it will be perfect for coffee drinking out back in the morning. My friend Roseann sent me a copy of her new book A Little Something and it's super cute. (check the Martingale site for more images from the book.) I'd had a few sneak peeks here and there but wow it's filled with the most adorable projects. All the photography and graphics in the book are wonderful, I love all the details. It's so nicely done. 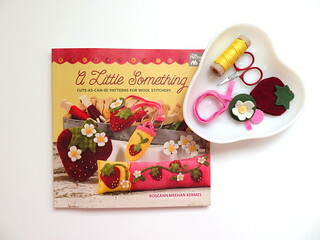 Roseann also snuck in an adorble kit for the scissor fob on the cover, all I had to do was cut out the strawberry pieces and the flower. And believe it or not, I'm on it already. In fact, after I took these photos I stitched the little seeds on the strawberry, and now I need to find just the right red and green for sewing those together. I'm not a sitching genius but there are nice little photographs of all the stitches used so you can get going fast. You can order an autographed book from Roseann here. Roseann has a great Wool Workers group on Facebook you can join and keep up to date with Roseann and a other wool working friends! I love seeing all the projects. 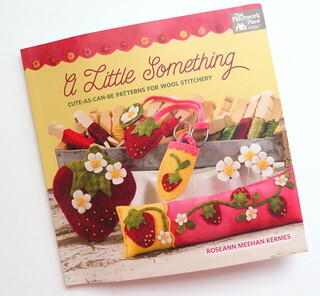 I hope you check out Roseann's book.. it's super cute. I'm lucky to have such a clever friend! Thank you Roseann for sending it to me! 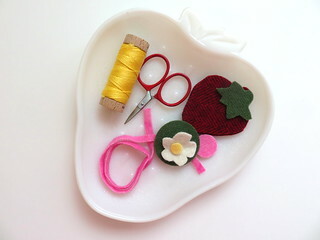 Dying over your sweet blog ... and the fact that you're actually stitching something! Thank you so much!! My copy is in the mail! Cannot wait to drool all over it ... so exciting! Cute fob! Do you weight your fobs? When I was teaching and designing needlework, I always had my students weight their fobs. It is so the fob hits the floor first-before the points of the scissors (reduces the chance of points breaking off). Coins taped together work well for this.